MADRID, Spain, 2017-Jun-14 — /Travel PR News/ — Over 30 countries and Affiliate Members of the World Tourism Organization (UNWTO) gathered last week in Chisinau, the capital city of the Republic of Moldova, for the 61st Meeting of the UNWTO Commission for Europe. 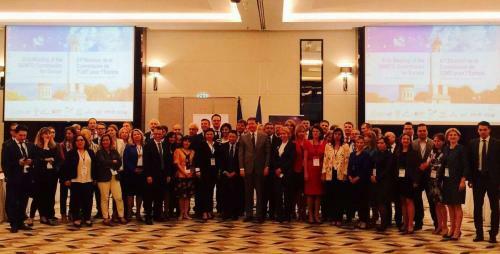 Participants discussed the priority areas for the Organization as well as strategies to position the tourism sector as a key driver of sustainable development in Europe (6 June 2017). UNWTO Secretary-General Taleb Rifai met the Prime Minister of the Republic of Moldova, Pavel Filip, to discuss the role of tourism in the socio-economic development of the country. The meeting underlined the importance that Moldova is giving to the tourism sector in the country’s economy. The Meeting was completed with an Official Event of the International Year of Sustainable Tourism for Development 2017 showcasing initiatives developed in Italy and France – Ecobnb (http://ecobnb.com) and Betterfly Tourism (http://www.betterfly-tourism.com) and a tree planting ceremony with the presence of UNWTO Secretary-General, the Director General of the Tourism Agency of the Republic of Moldova, the Head of the EU Delegation to Moldova, Pirkka Tapiola, and the diplomatic community of Moldova. This entry was posted in Business, Festivals and Events, Tourism, Travel, Travel Management, Travelers and tagged 61st Meeting, Chisinau, Commission for Europe, Moldova, Pavel Filip, Stanislav Rusu, Taleb Rifai, UNWTO. Bookmark the permalink.